As soon as this was announced, I knew it would be a hit, and something that I would personally enjoy as well. While a basketball video game obviously has to bring a lot more to the table than just fun customisation tools, they are very appealing (as well as addictive) features. 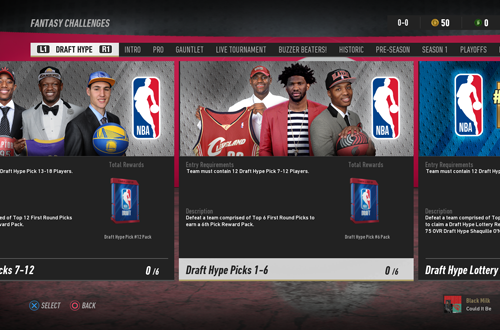 Just look at the customisation options that NBA 2K has featured in MyCOURT, MyTEAM, and 2K Pro-Am. 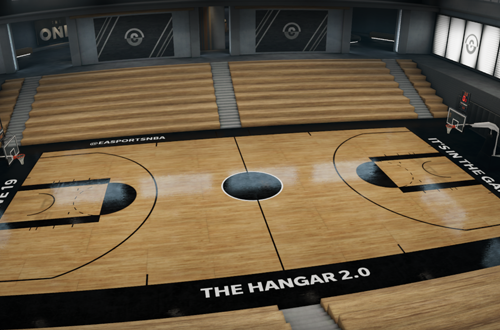 It’s great to see NBA Live starting to introduce similar functionality, and a custom homecourt for our player in The One is a good place to start. The inability to upload custom images is naturally a drawback, but without a vetting system in place it would get very messy, so it’s understandable. Besides, we do have a good selection of images available to us at the start, with many more to unlock by playing through The One, taking part in Court Battles, and raising our Court Hype. The tools we have at our disposal – choosing a colour scheme and customising every line and segment of the court, adding fancy decals, and modifying everything from the court surface to the basketball – are more than sufficient. On top of the aforementioned Court Battles, I also really like that our One Court is used as the game’s practice arena outside of The One. It’s fun to create courts, and a great way of putting our own stamp on NBA Live 19. It’s clear that The One was where a majority of the focus went in NBA Live 19, and I believe it’s fair to say that it paid off. Once again, the mode’s story is straightforward and unintrusive. There’s no deep narrative, nor any lengthy cutscenes to be bothered with. The Rise is a well-produced backdrop to the early stages of your career, and also serves as an enjoyable tutorial as it introduces you to various elements of this year’s mode, such as The Streets World Tour and Court Battles. The latter is already proving to be quite popular, fleshing out The One beyond being a simple career mode with the standard connected online experiences. Those are still present of course, making The One the deepest mode in the game by far. That’s not necessarily to my preference as I’m finding myself burned out on the career experience, but it was vital that NBA Live 19 delivered in this area. 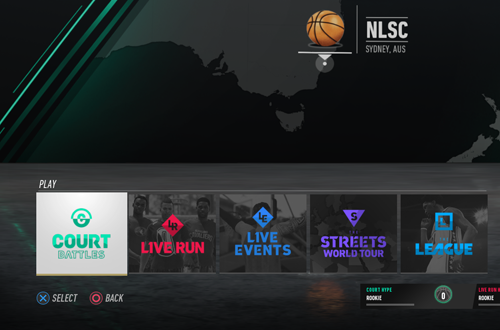 The career modes are the most popular experience in basketball gaming at the moment, and NBA Live 19 has sought to appeal to gamers with a combination of an NBA career and a campaign mode that’s not unlike the ones we saw in NBA Street. While I would like to see future NBA Live games beef up the NBA content and other traditional features, The One has become an engaging mode and legitimate draw in its own right. Are you sick of microtransactions, pay-to-win mechanics, and the way that they’ve come to determine the competitive balance in online basketball gaming? Well, good news! 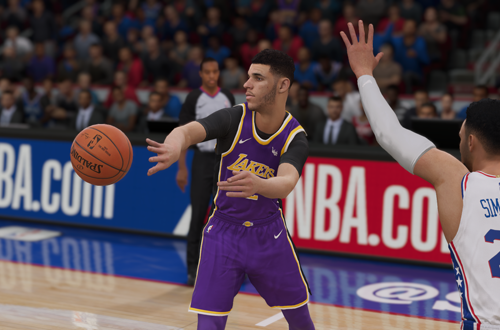 For now, EA Sports continues to avoid those mechanics, as the only way to improve your player in NBA Live 19’s The One mode is to play the game and earn XP. Although the journey to maxing out your player is hardly akin to ducking around the corner to the local supermarket, it’s far from a tedious slog through muddy terrain, either. Once again, our starting ratings are quite generous, with our player beginning at 70 Overall. 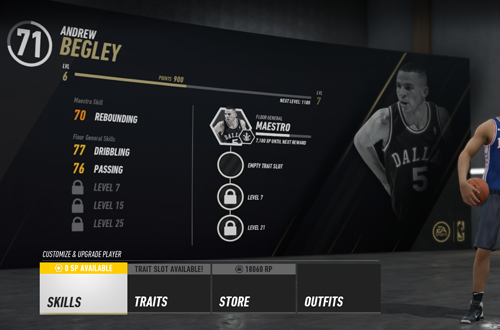 Skill Points, Traits, and other attributes are earned at a steady pace. In some ways, I would prefer being able to upgrade every rating manually as in older games and NBA 2K’s MyCAREER. However, simply focusing on the key skills for your chosen Play Style and being able to earn upgrades to other ratings via the new Icon system is an effective method of as well. Overall, it feels like there’s a lot less grinding, and while there’s less flexibility in the linear approach, it’s a rewarding path to becoming a star like the iconic player you’ve chosen to mould yourself after. As always, having separate currencies for player upgrades and the collectable cosmetic items also means that you never have to choose between improving your player and outfitting them with some new gear. I’m glad NBA Live 19 has kept this approach. I’ve mentioned on several occasions that Ultimate Team was my mode of choice in NBA Live 18, and I can see myself spending time with it in NBA Live 19 as well. Although it wasn’t a primary area of focus and a lot of the features are very much the same as last year, LUT has benefitted from some key changes and additions. One of the best moves, in my opinion, is the removal of player contracts. Contracts feel like an outdated mechanic when it comes to the team building modes, limiting the fun by adding to the grind and giving you something else to worry about (and spend currency on, real or otherwise). Removing them has created a much freer experience. There’s also a lot of content in Ultimate Team at launch with a plethora of challenges, and with any luck, there’ll be a steady stream of new content throughout the season, too. It’s looking like it will be a lot easier to put together decent teams early on, with plenty of opportunities to acquire better cards as the year progresses. I’m a little iffy about the new approach to card ratings as I feel they may be a bit too low, but it does work. I also really like that we don’t have to waste time on the really easy challenges, as they tend to just be one quarter long. There’s much that can be done with Ultimate Team moving forward, but as it stands, already it’s very solid and appealing. At the end of the day, gameplay is paramount, and NBA Live 19 has taken further steps to improve in this area. The Real Player Motion technology has definitely been a worthy addition, smoothing out long-standing issues with player animations, and a lot of the uglier animations have continued to be phased out as well (especially when it comes to layups and post moves). It’s easily the best looking and best feeling game since the reboot. Some will snidely point out that that’s not necessarily a high bar, but a lot of work has gone into improving the game in this area, and those improvements are really paying off in NBA Live 19. Gameplay is moving in the right direction. While I would like to see the game keep making strides towards being a realistic sim as far as strategy and authentic team styles are concerned, there are more elements of that this year. Players move around a little more to get into position, the CPU takes more three-pointers, and even with the default sliders, NBA Live 19 plays a decent game of NBA basketball. I’m interested to see what we can do after playing around with the sliders a bit. The steal system feels less canned and more organic, defense is better in terms of AI and player control, and it’s a bit harder to just dunk it every time. In short, the team has done a very commendable job with gameplay this year. Unfortunately, there are some noticeable legacy issues in NBA Live 19. Beginning with gameplay, passing is still problematic. Passes aren’t quite as crisp as they should be, making it difficult to whip the ball around the perimeter. Right stick passing does help a little, but there’s no guarantee that the ball will go to your desired teammate. There are also lingering moments of sluggishness where the player you’re controlling feels a step slower than the AI, and although defensive rotations are better than in NBA Live 18, there are times when your teammates are slow to collapse on players driving the lane. As noted, diversity and realism in team strategies could be better. Browsing the menus also remains a little cumbersome, not only due to the new layout (which I’m not really a fan of), but also the constant loading of content. I’m not sure whether it’s the speed of my connection or the fact that I’m in Australia, but moving through the menus is a lot slower than I’d like. Speaking of PAL region drawbacks, the game’s measurements have once again defaulted to metric for me, with no option to switch them to imperial. The menus aren’t centred properly on my TV either, and I can’t seem to fix that with any adjustments in the settings. The lack of certain modes and functionality does also inspire an all-too-familiar feeling of “hopefully next year”. I’ll just come right out with it: I’m not a fan of Jay Williams as an analyst or as a commentator, in real life or in NBA Live 19. He has some of the worst takes of anyone covering the NBA, and a smug attitude despite being one of the biggest busts of the past twenty years, flopping in the NBA and then foolishly throwing away his career with a reckless motorcycle accident. It is painful having to listen to his awful, self-righteous opinions peppered throughout NBA Live 19’s commentary. Ed Cohen isn’t much better, sounding dull and uninterested. It’s easily the worst commentary in the history of the series. Yes, even worse than Reggie Theus in NBA Live 2000! Obviously, it’s easier to bring them into the studio to record new lines for the dynamic commentary that will be pushed through this year, but frankly, it’s not worth it. We’ve gone from the lead NBA on ESPN/ABC broadcast team of Mike Breen and Jeff Van Gundy to what feels like the Z-Team of announcers. Even putting aside my dislike of Williams and his terrible takes, the commentary just doesn’t sound very good. It’s dull, lifeless, and just plain repetitive. I’m tempted to rank it higher on this list, but there are more important issues, and at least they can be turned off. Still, I feared the worst when the new team was announced, and it turns out they’re even worse than that. Admittedly it’s important for NBA Live to cover all the basics before it gets too fancy, and flash over substance is exposed very quickly. However, NBA Live 19 definitely could have had more in the way of extra content. Let’s start with Legends. I have a feeling that the NBA Live team doesn’t really want to go head to head with NBA 2K here, and that’s understandable. 2K has set the bar really high when it comes to retro content and has exclusive deals with some big names to boot, so NBA Live’s efforts are going to come off second best. Nevertheless, features like a Legends Pool, Decade All-Star teams and a big selection of retro jerseys would all be great. Basically, being able to play with Legends outside of Ultimate Team in any way would be a step forward. The same goes for adding some other bonus teams, like the old International and European All-Stars, squads made up of recent Draft Classes, and so on. The WNBA teams have proven to be a great addition in this regard, but there’s more that can be done. It’d also be fun to be able to put together some squads of NBA players and play exhibition games on the courts that are featured in The Streets World Tour. Whether it’s Legends, special All-Star teams, or authentic venues, NBA Live could (and should) expand its content with the properties EA has already licensed. 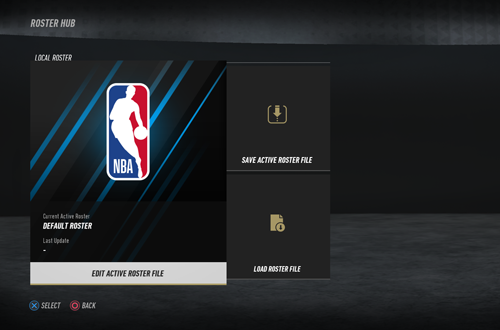 When roster editing was added in Patch 1.08 for NBA Live 18, it was huge. 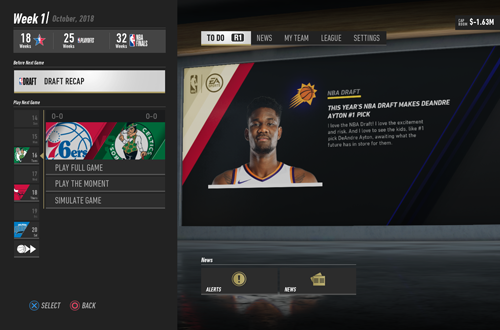 I had thought we’d have to wait until NBA Live 19 for it to be implemented, but EA found a way to patch it into the game post-release. Fortunately, roster editing returned this year without needing to be patched in, though it doesn’t include any new features or functionality. In fact, the trade player option is actually missing when editing the default rosters. We can assign players to another team or move them around via the free agent pool, but we can’t trade them directly for one another. It makes moving players from team to team a bit clunky, so hopefully that can be patched back in. A much bigger problem is the lack of sharing functionality. It doesn’t completely defeat the purpose of having roster customisation, as it’s important that we can all edit the game to our liking, but it does restrict what we can do with that functionality as a community. We can manually post steps to create certain players or whip up custom rosters, but that’s nowhere near as convenient as being able to share a roster file. A community upload/sharing service has basically become standard in sports games, so whether it’s rosters, created players, slider settings, or other custom content, we need to be able to share it with each other. Unfortunately, we can’t do that in NBA Live 19. 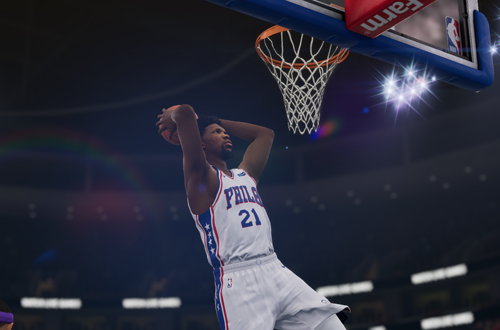 Despite the promise that all modes would be receiving some attention, very little has been done with Franchise mode in NBA Live 19. It remains a bare bones experience, still lacking the depth we had in Dynasty mode on the previous generation, let alone MyLEAGUE or last gen’s Association. The focus was clearly on The One in NBA Live 19, and that is understandable. 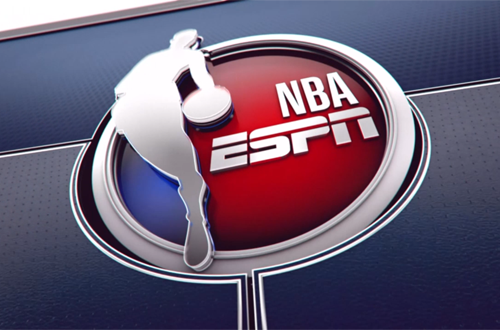 It’s a tremendous hook for the series, and appeals to a current trend in basketball gaming. However, it is important that EA’s game has depth to its franchise experience: player editing, All-Star voting, playable practices, multi-team control, custom draft classes…all things we’re sadly no closer to having. Look, I’m really not sure what we can expect moving forward. I get the impression that the team isn’t that keen on developing Franchise mode very much. Perhaps they see it as an outdated mode, no longer relevant to the direction of the game or the “younger demographic” that they covet. If so, that’s unfortunate; for us, and for them. 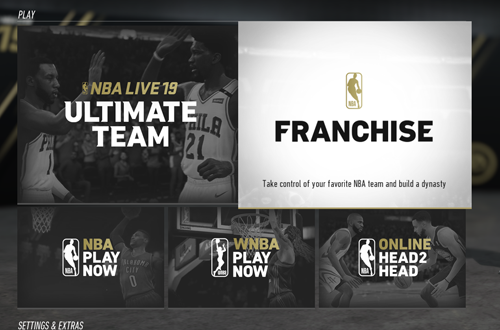 I absolutely believe that the franchise experience is still relevant and popular, and the amount of posts I see asking about or criticising NBA Live 19’s Franchise mode does suggest that I’m not alone. If there’s anything that can be added via a patch, I know it would be gratefully received. Otherwise, it needs to be a higher priority next year. Those are my initial impressions of NBA Live 19. I’ll be going into more detail on many of those points in my full review, but for now, what do you think of NBA Live 19 so far? Have your say in the comments section below, and as always, feel free to take the discussion to the NLSC Forum! That’s all for this week, so thanks for checking in, have a great weekend, and please join me again next Friday for another Five. Fair and to the point. Thanks for sharing your thoughts!